I have been asked about our nursery by a few people and FINALLY have a couple of pictures to share. 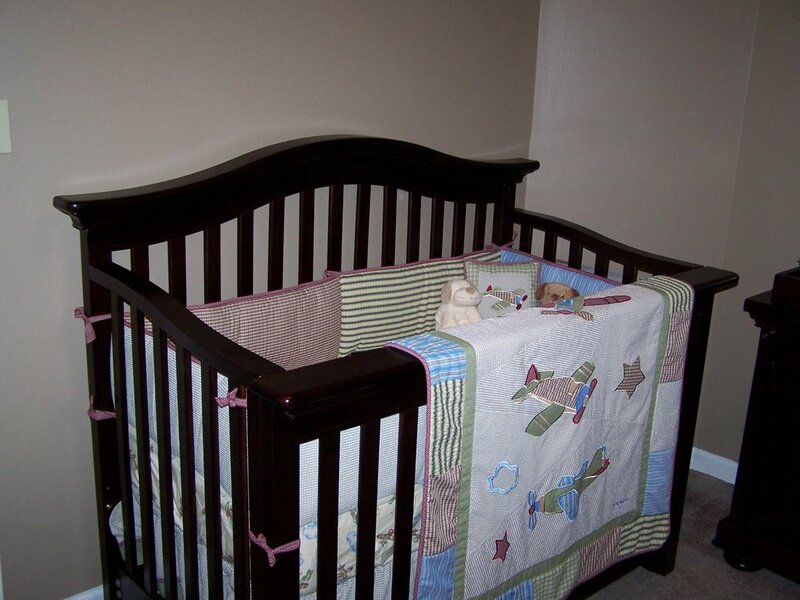 Right now, we have our furniture (2 cribs and a changing table) in the room - and it takes up most of it! We got the cribs that will make into toddler beds, daybeds, and full-size beds, so they are a little bit larger than a regular crib. 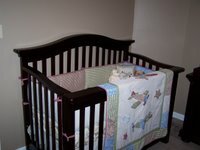 I put the bedding on one of the cribs this morning. We are still working on getting things organized and figuring out what we are going to put on the walls, but I think we almost have it figured out. As soon as we do and get it up, I promise to post more pictures. As you can see in the picture, we are decorating with airplanes. 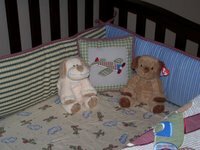 We did not go with airplanes for any particular reason other than the fact that I could never find the "perfect" bedding that I was looking for and this one was at the right place at the right time. One day, when we were at BabiesRUs, I saw this bedding and the colors were exactly what I was looking for (and I really thought the bedding was cute), so I decided to get it. I want to incorporate some of Phillip's old wooden toys into the room as well, but I have yet to figure out where to do that because the room is pretty full as it is. Hopefully I can share more pictures soon.